What’s the Best Time to Burn? As I mentioned last week, prescribed fire can help meet many prairie management objectives. It’s important, however, to match the timing of the burn to those objectives in order to avoid conducting a fire that is either unproductive or counterproductive. For example, if you’re burning to set back trees or invasive plants, you’ll want to be sure to burn when the fire will suppress those species and encourage growth of competing plants. 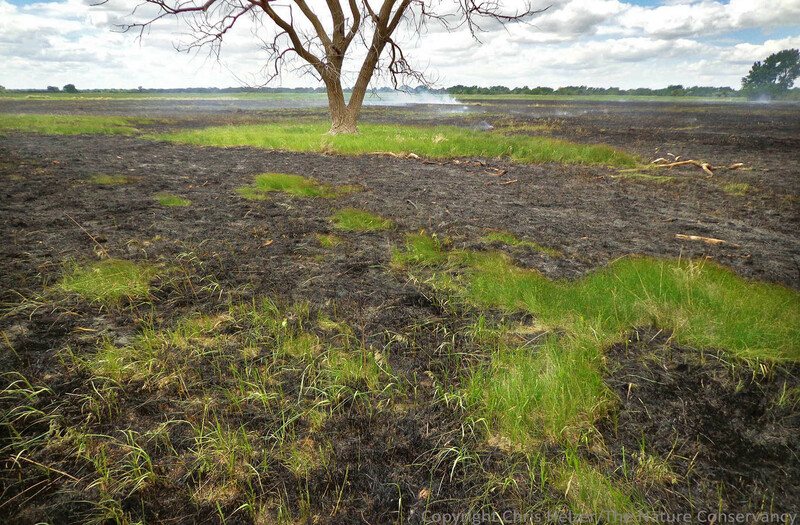 Too many times, people burn to control smooth brome or another invasive cool-season grass but burn so early in the season that they end up helping the plants they’re trying to hurt. Here are some examples of various management objectives for prescribed fire, along with examples of how to time those burns to meet those objectives successfully. This early March burn (dormant season) will stimulate the growth of cool-season invasive grasses such as smooth brome or Kentucky bluegrass. However, we brought in cattle to knock back the strong growth of those species. In the Platte River Prairies, our biggest invasive species threat comes from smooth brome, Kentucky bluegrass, and other invasive grasses that grow early in the season. They can monopolize space and moisture, reduce plant diversity and wreak havoc on habitat conditions. When we target those species with fire, we try to burn when the targeted species is just about to bloom. By doing so, we can knock the brome or bluegrass back after it has invested energy in growth but before it invests in reproduction. At the same time, we create excellent conditions (lots of light and warm soil) for competing warm-season native species which are just getting ready to start their growing season. Bluegrass blooms significantly earlier than brome, so we can’t get maximum impact on both species with one burn. Instead, we have to decide which is the more dominant grass at the time. Regardless, the timing of our burn is aimed at the growth stage of the plant, not a particular date, since plant growth rates vary by year. One issue we’ve seen with using fire to control brome or bluegrass is that while we can suppress those cool-season grasses and facilitate growth of warm-season native grasses, we often just trade one dominant grass for another without encouraging overall plant diversity. As a result, we often combine cattle grazing with fire to add a more selective defoliator (cattle) to the mix. When we’re using grazing, the timing of the fire can be more flexible. We can conduct a burn in the fall or early spring, and while that will stimulate strong growth of brome and bluegrass, we can use intensive spring cattle grazing to counter that strong growth and suppress those invasives. Later in the summer, a fairly light stocking rate of cattle can help suppress major warm-season grasses and keep them from simply taking all the space left open by weakened invasive grasses. This creates opportunities for wildflowers to flourish. Since cattle prefer big bluestem and indiangrass over all other plant species in our summer prairies, that kind of grazing usually works pretty well. There are too many potential combinations of fire and grazing to cover here, but suffice it to say we can burn at many times of the year when using cattle to complement the effects of those fires. This fire was conducted at about the time Kentucky bluegrass was starting to bloom, so it should knock the vigor of that species back for a year or two. If cattle aren’t an option but you find that fire alone just encourages dominant grasses of one kind or another (a more common result in the Great Plains than in the Midwest), one option could be a summer fire. If you’ve never seen a summer prescribed fire, you might find it hard to believe that green prairie can burn, but as long as there is sufficient old growth from previous seasons that dead vegetation will carry a fire, regardless of how green this year’s vegetation is. (That green vegetation does make summer fires extra smoky, however.) If big bluestem is the dominant species you want to suppress, the best time to burn is when it’s just ready to bloom. Remember that there are many other factors to consider with summer fires, including the various animals that are active in the prairie at that time of year. It’s usually best to burn only a small portion of a prairie in the summer to avoid excess impacts on wildlife and invertebrates. However, summer fires can be very good for encouraging wildflower growth, and the habitat benefits from added plant diversity help counteract short-term impacts of the fire on animals. Another caution with summer fires is that if cool-season invasive grasses are a problem at a site, they will likely benefit from a summer fire, and could thrive during the following fall and spring without some other treatment. 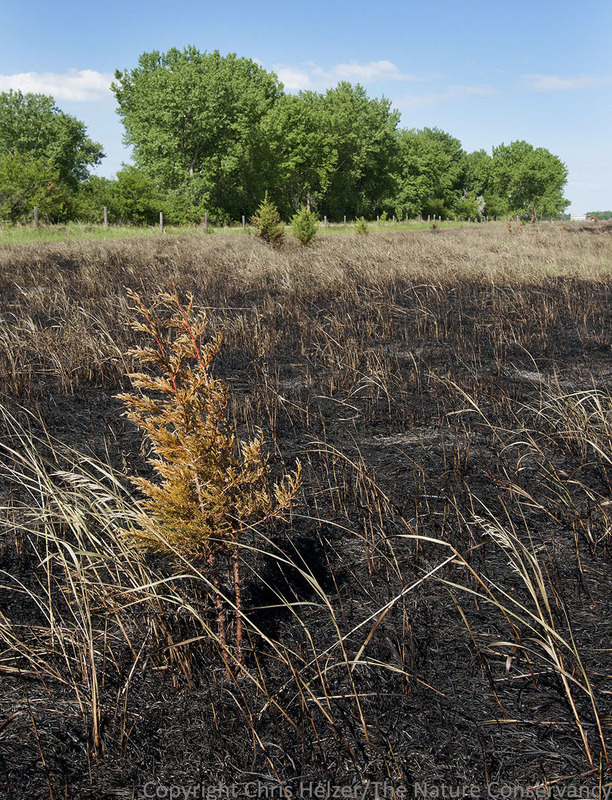 Controlling trees with fire is a common objective for prairie managers, but timing is also important for that objective – and appropriate timing varies by the species of tree being targeted. We’ve had some very good late spring burns that suppressed brome wonderfully but failed to kill small eastern red cedar trees. I think the trees failed to die because there was insufficient heat created to make up for the increased moisture in the stems at that time of year. The trees turned yellow-orange after the fire but then greened up again. We’ve found dormant season fires to be far more successful when we’re targeting cedars. On the flip side, it seems like we’ve had the best luck suppressing (but not killing) dogwoods and other deciduous trees and shrubs when we burn as those species are just leafing out later in the spring. However, our success with deciduous plants has been inconsistent enough that I hate to make recommendations – and deciduous tree control with fire is usually temporary at best. Dirac Twidwell, range ecologist at the University of Nebraska-Lincoln, has experimented with intense summer fires during drought conditions in the southern plains and has found that the combination of high temperatures and drought stress can be deadly on trees not ordinarily considered to be susceptible to fire. Unfortunately, burning under those conditions takes much more training and preparation (and more trusting fire chiefs) than most of us can muster. This cedar will probably survive this growing season burn. It turned yellow but will likely turn green again and continue its growth. Dormant season burns include any fires conducted after the prairie turns brown in the fall and before it greens again in the spring. Impacts from late fall and early spring burns are pretty similar to each other, with the caveat that fall burned prairies have bare ground all winter long, which can dry out the soil somewhat and – obviously – provide very different winter habitat than prairies with standing vegetation for species that need that. Drier soil and bare ground are not necessarily bad things, especially if there is other prairie habitat nearby. In fact, some managers in northern parts of the United States have found that bare soil over the winter can help winter kill Kentucky bluegrass during particularly cold winters. Fall or winter burning can also help extend the window needed to find the right weather to conduct a dormant season burn. Depending upon your objectives, those fall burns could be just as effective as an early spring burn and you can relax all winter, knowing that your burn is already done. One additional consideration with fall burns is that the day length (at least in North America) is considerably shorter in November than in March, giving you less time to conduct a fire during daylight hours. There are many other possible objectives for prescribed fire, and examples of how to achieve them. Those of us who harvest seed for restoration work, for example, use fire to stimulate seed production in some species (especially big bluestem). 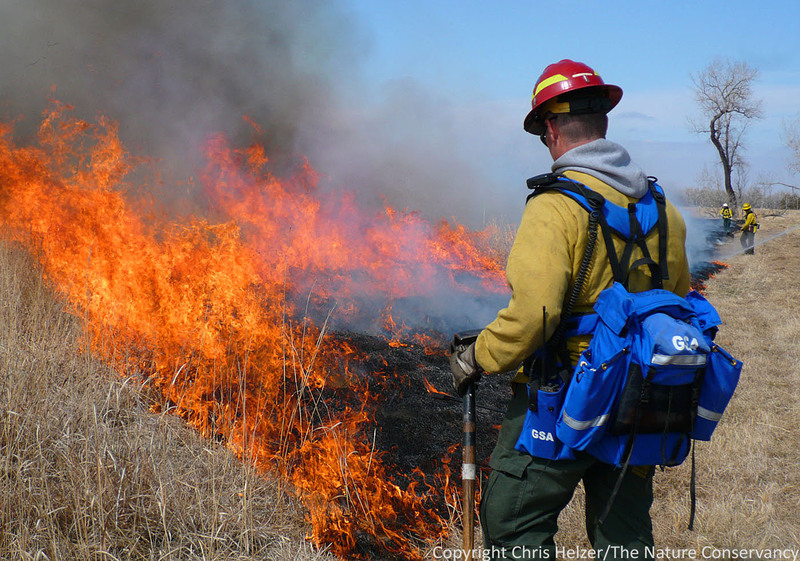 In addition, because time since the last fire is linked to the amount of thatch and litter present in a prairie, burning can help manipulate habitat conditions for many wildlife species. Speaking of wildlife, it’s critically important to remember how vulnerable some invertebrates and animals are to fire and to keep that in mind when setting burn objectives. Burning an entire prairie (especially one that is isolated from others by roads or other obstacles) can completely eliminate some species of invertebrates that are aboveground during the fire – including many that overwinter in standing dead vegetation. Depending upon your other objectives, you might consider not going into a burn unit to light all the patches of vegetation that didn’t burn initially – leaving those unburned areas can provide important refuges for vulnerable insects and other critters. In addition to invertebrates, nesting birds, recently emerged reptiles in the spring, and other less mobile animals are all species to consider as you plan growing season burns. There will always be negative impacts of any fire, but they should not be reasons to avoid burning. Instead, they are examples of why it’s so important to have clear objectives so that you make sure you get the desired benefits from the fire and minimize the undesirable outcomes. This growing season burn left behind numerous unburned patches, providing refuges for invertebrates and other small animals. 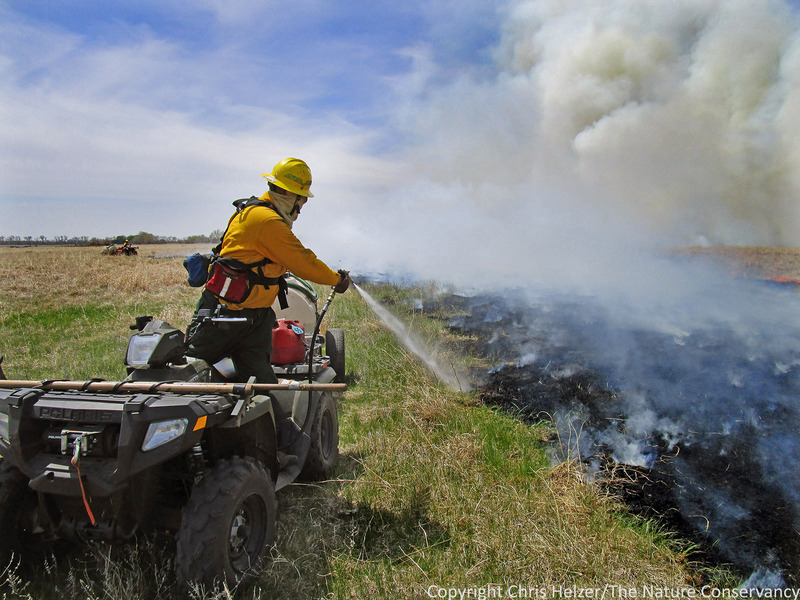 Fire is a powerful but dangerous tool for prairie management. While it can be very useful for a wide range of objectives, there are too many risks (to people, property, and wildlife) to use it in a cavalier manner. Setting specific goals for a fire and being thoughtful about the timing and tactics for that fire will help ensure that it is as productive as possible.